Enjoy yourself at the Wave Pool! Play in the waves, lounge on water mats, soak in the warm water of the swirl pool, ride the thrilling 160 ft. twisting water slide or simply relax in our on-deck sauna! 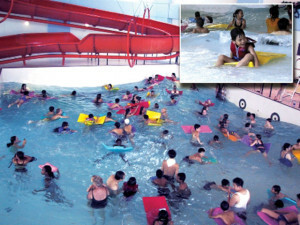 All this at the only indoor wave pool within the Greater Toronto Area – a year round sun and surf destination. Plan a visit while you’re in the area. It’s an attraction not to be missed! There’s lots of exciting water play for all ages and it’s safe. You don’t have to worry about the undertow here. Our friendly, trained lifeguards make sure everyone is playing safe so you can all have fun. As well, lifejackets are available free of charge. We have male, female and family changerooms to make your entire visit to the Wave Pool fun and convenient. Aahh…feels great in the swirlpool! It’s huge! Situated right next to the Wave Pool, the swirlpool has lots of room to sit back and relax. You can also get warm and comfortable in the large on-deck sauna. 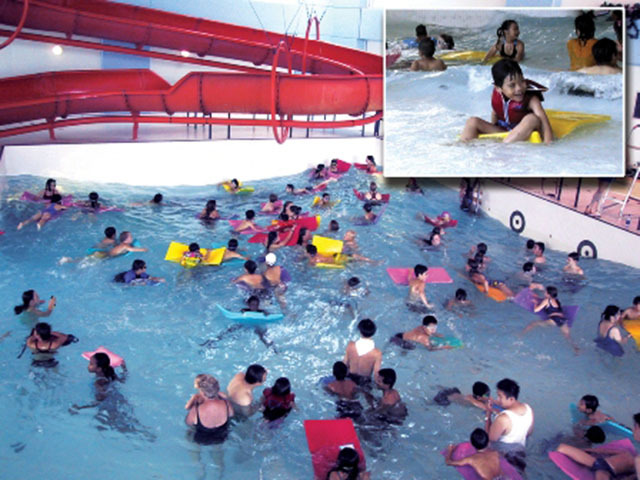 The Wave Pool is available for group rentals to schools, community groups and businesses. There is no better way to celebrate a birthday than with your friends at the Wave Pool. From the building entrance to the entry ramp into the Wave Pool, you’ll find the centre has been built with ease of access as a priority. The swirlpool has a specially designed section for therapeutic use, complete with wheelchair lift right into the water.